Sun. March 11 1866 We all went to church at the 1st Presbyterian Father & Mother Beebee in the one horse buggy. My wife Ada Riser & I in the two horse carriage. Eld. Oxtell Preached Father read Sermon in [illegible] Mon. 12 Father took the cars for Clinton and Ada went to school. 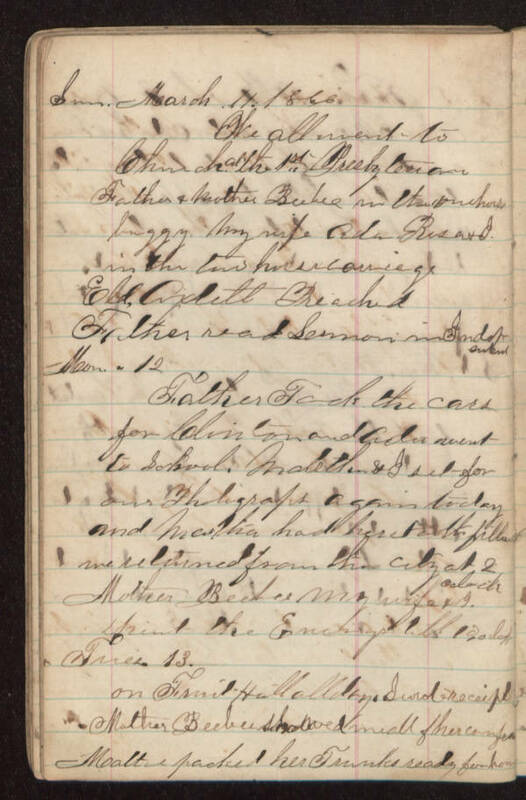 [illegible] & I sat for our photographs again today and Martha had her tooth filled we returned from the city at 2 Mother Beebee my wife & I spent the evening till 10 oclock. Tues. 13. On Fruit Hill all day. I wrote receipt Mother Beebee showed me all of her [illegible] Mattie packed her trunks ready for home.